Bed And Breakfast204 sq. ft. 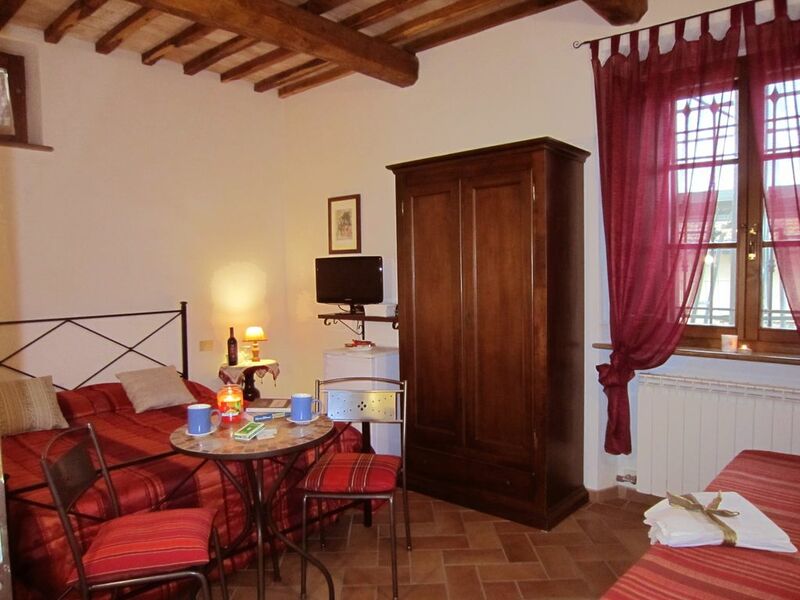 Le Logge di Sopra, a family-run B & B, is located in the Tuscan countryside in the heart of the Crete Senesi. With the renovation of the old farmhouse, dating back to the 16th century, 3 comfortable rooms and 2 bright and climatically comfortable apartments have been created. The structure guarantees its guests tranquility and privacy, considering the small number of people that we can accommodate at the same time. The 2 apartments, furnished in style, with rustic floor and ceiling with chestnut beams and bricks, both consist of a bright living room with kitchenette (including 2/4 gas rings, fridge, electric oven, electric kettle, crockery) more a comfortable and large double sofa bed, double bedroom and bathroom (with shower, hairdryer, courtesy kit) with separate dressing room. The 3 double rooms, furnished in style with rustic floor and ceiling with chestnut beams and bricks, cozy and reserved, are all equipped with bathroom (with shower, hairdryer, olive oil courtesy kit) private interior with separate dressing room , mini-bar, electric kettle, tv-color with satellite decoder, linen and towels, table and mosquito nets on the windows. This is the ideal place for those who want to spend a relaxing holiday in the beautiful Tuscan countryside, with all the comforts of a well-kept environment and the advantages of a family welcome. Ideal also for weekends in winter thanks to the nearby thermal facilities always open, 10 minutes (in Rapolano Terme). Guests have at their disposal for their moments of relaxation a solarium where you can enjoy a vast and spectacular view, as well as a garden with attention to detail with inside the pool. It also has free private parking with automatic gate, for total comfort. Outside and breakfast: The swimming pool (measuring 6m x 12mt, equipped with a trampoline), surrounded by plants to welcome guests with the necessary discretion, has chairs, tables and sun beds in order to enhance the comfort of the environment. The night lighting, then, enhances the charm of the place, allowing you to lull in this magnificent scenery. The cozy breakfast room, obtained in the old rustic, offers you the thrill of a breakfast full of delicacies. You will taste homemade cakes, biscuits and fruit jams, the typical millefiori honey of these areas. In addition, the cured meats like the Tuscan ham or salami and the typical cheeses of the Crete Senese as the 'pecorino', combined with exquisite bruschetta with our own oil and aged balsamic vinegar aged in chestnut and juniper barrels. The bathroom, spacious and private in every room, has a separate dressing room, a bathroom with a glass shower cabin, a hairdryer and an olive oil courtesy kit. Among the other SERVICES OFFERED INCLUDED IN THE PRICE ABOVE EXPOSED are: * buffet breakfast * WI-FI internet, * tv-color, with digital satellite decoder, * minibar, * kettle, * hairdryer, * courtesy kit with organic Tuscan extra virgin olive oil, * bed linen and towels set (daily change of towels free on request, at extra charge and on request further changes), * daily room adjustments, * heating, * mosquito nets on the windows, * Free private parking with automatic gate * use of the swimming pool and the garden, * outdoor barbecue, * Panormian terrace with tables and chairs * information material (delivered at check-in), * payment by credit card and pagobancomat. Le Logge di sopra is located in the heart of Tuscany, in the center of the 'Crete Senesi', in a strategic position for which you are spoiled for choice of a quick tour or a pleasant week full of significant contents, among nature, history, culture, gastronomy and oenology. It is at 275 meters s. l.m., 5 km from Asciano, a small town of Etruscan-Roman origins where you can visit among other beauties a museum (recently opened) with Etruscan artifacts and objects of sacred art from the 1200s, an Etruscan burial mound. It is 5 km from the 'Site transitire' of Jean-Paul Philippe, in Leonina. It is only 17 km from Siena, a city famous throughout the world for the Palio (which is held on July 2 and August 16 of each year), and for its beautiful medieval buildings (such as Palazzo Pubblico inside the square shell of the field. San Gimignano, which is a true medieval jewel, is 65 km away. We are 110 km from Florence, 35 from Montalcino (famous for Brunello wine), 37 from Pienza (within the naturalistic park of Orcia, of particular Renaissance interest, but also known for its typical products, among which stands out the 'pecorino di Pienza'), 130 from Pisa. Other places not to be missed are: Montepulciano (where you can find the wine of Nobile di Montepulciano, visit the Cathedral and the church of San Biagio), Monteriggioni, Cortona, Assisi, Volterra. You can visit some beautiful abbeys: Monte Oliveto Maggiore (13 km), a charming 1400s Abbey with a beautiful Romanesque-Gothic church, a cloister completely frescoed by Sodoma and Signorelli whose frescoes narrate the life of Saint Benedict, to whose motto ora et labora 'are inspired by the Benedictine monks), Sant' Antimo and San Galgano (famous for the sword in the rock). In addition there are spa facilities always open, even in winter, just 15 km (in Rapolano Terme). Other spa facilities, not far away, are in Bagno Vignoni and Bagni di Petriolo. For those who love skiing, 65 km. on Monte Amiata (1. 800 meters above sea level) fun is guaranteed!